Paracas to Nazca Tour (17:10 p.m. - 21:00 hrs). Overflight Nazca Lines - 40 minutes. Bus trip to Arequipa from Nazca (14:30 p.m. - 23:00 hrs). At night tourist bus trip from La Paz to Uyuni (All night from 21:00 hrs - 07:00 hrs). Visit to the "Lake of color" to see how the waters appear to change color. Tourist bus ride from Uyuni to La Paz (At night from 21:00 hrs - 07:00 hrs). Aircraft flight La Paz - Cusco (Aerosur) (50min). Machu Picchu Tour (all day from 06:00 hrs - 20:00 hrs). First day: "Welcome to Lima City Tour around the city." Day Two: "Flight from Lima to Trujillo and Tour" Chan Chan. " After breakfast at the hotel, we will collect them and bring them to the airport in Lima, there was realized the respective check for flight an hour to the city of Trujillo "Capital of Eternal Spring", our staff will be there welcoming and Trujillo airport transfer to hotel.After lunch at 14:00 hrs will begin the tour of the city and its surroundings more interesting, as the center of town, surrounded by the famous colonial houses: The House and Casa Risco Urquiaga (now the Museum of Archaeology ), the Cathedral with its collection of paintings from the Quito School, the Monastery of El Carmen Museum of Art. 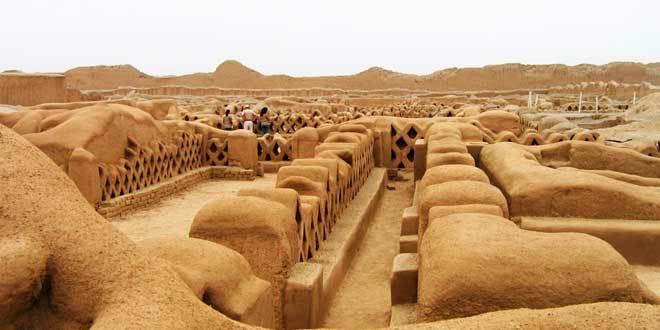 Also we will visit Chan-Chan "The largest mud city in America" and the Pyramids of the Sun and the Moon. Whose walls are decorated with beautiful and colorful human figures of mythology Mochica. This would be a building with funeral, ceremonial and possibly administrativos. Pyramid of the Moon is made of superimposed temples according to different stages of the Mochica. Archaeologists have discovered a tomb with more than 40 soldiers killed. (Photo: Chan Chan). Third day: "Travel by bus from Trujillo to Chiclayo and Chiclayo City tour." Fourth day: "Lord of Sipan Tomb Museum - Pyramids Tucume." After breakfast we transfer to the Lord of Sipan Royal Tombs Museum preserves the material collected by Dr. Walter Alva in the archaeological complex of Huaca Rajada Sipan, the display shows the Lord of Sipan with all her jewels, some tombs of warriors Moche and important pieces of gold. The museum's architecture is inspired by the ancient Mochica sanctuaries where they combine platforms. Today is considered one of the best museums in South America. In the afternoon we tour the Pyramids of Tucume is characterized by its 26 pyramids, among which are: Huaca del Pueblo, La Raya, The Sun and The Stakes. Finally overnight at the hotel. (Photo: Lord of Sipan). Fifth day: "Travel by bus from Chiclayo to Chachapoyas." Sixth day: "Tour of Karajía The Coffin." After breakfast, our staff will transport them by bus to the old Coffin of Karajía. This day will make an interesting excursion to 1 hour and 40 minutes of accommodation, allowing us to admire the buildings located Revash funeral on top of a mountain. The Sarcophagus of Karajía belonged to the Archaeological Complex Chipuric within Chacha Culture which is uniquely characterized by burial in the world to their dead. It is interesting to note that the sarcophagy contain two parts head and busts worked in compact form and the capsule burial contained the outline of the body. The head is topped by a skull trophy. Return to your hotel. (Image: Sarcophagus of Karajía (Photo: Coffin of Karajía "). Seventh day: "Tour to Kuelap Archaeological Complex." Eighth day: "Travel by bus from Chachapoyas to Chiclayo and flight to Lima." Ninth day: "Tour to the" Islas Ballestas "and" Reserve of Paracas. " After our breakfast, we travel to the port of Paracas, the wildlife sanctuary's most important Peruvian Coast.Motor boat trip to Ballestas Islands in Paracas National Reserve, where we can see sea lions, penguins, pelicans, penguins and other seabirds. In return we will have the opportunity to see the "Candelabra", a giant figure in the style of the Nazca Lines made in the sand.Free time before returning home to take pictures of sea lions, seals and seabirds. After arriving at the port will make the tour to the Paracas reserve. In the afternoon we head to the bus station in the city of Paracas to take their bus to the city of Nazca trip usually lasts three hours, and in Nazca our staff will be waiting to transfer you to your hotel. ( Photo of Ballestas Islands in Paracas). Tenth day: Flight over the "Nazca Lines." On the morning with breakfast, transfer to Nazca Airport for a flight over 45 minutes on the Pampas of Nazca, where the ancient pre-Inca drew huge figures of animals and plants, so undiscovered, many believe that these figures were made by extraterrestrials, among which are the monkey, a spider, a hummingbird, etc.Then he will visit the "Cemetery of Chauchillas" then move passengers to the bus station Nazca to make their journey to the city of "Arequipa" (Photo: Hummingbird Nazca Lines). Eleventh day: "Going to Colca Canyon and Vicuña Reserve." Twelfth day: "Colca Canyon and condors view." In the morning, heading towards the "Cruz del Condor, where the canyon begins to appreciate as its depth, as well as the largest bird in the world can be seen circling over the agricultural terraces are cultivated since pre-Inca . Enjoy the wonderful views offered by the Colca Canyon one of the world's deepest (3,000 m). Back to Chivay, visit to the Mirador de Chinina, where are the famous Hanging Tombs and the Siphon Bridge linking the towns of Yanque Coporaque. At the town of Yanque, visit its beautiful church and its stone streets among other attractions. We will stop at the viewpoints of Choquetipo, Artahuilque Maca and people to see again the Colca Valley, then return to Arequipa to rest. (Photo: Condor on "Cruz del Condor in Colca Canyon" (Photo: Uros Islands on Lake Titicaca in Puno). Fifteenth day: "Tour of Copacabana and Isla del Sol"
Breakfast in the hotel, then be transferred to the bus station in Puno to address the tourist bus headed for Copacabana travel time 3 hours. In Copacabana visit the Cathedral, the Sanctuary of the Virgen Morena and La Plaza Principal. At noon we will taste a typical lunch, then we will make the tour to Isla del Sol, across the lake for about an hour and a half to reach the southern part of the Isla del Sol, where we visited the Archaeological remains of "Pillcokaina-Temple Inca ", a religious center, then a short walk through the steps of Yumani, until you reach the fountain of youth, there you can cool off by taking a bit of holy water, it is believed that this source is the source of eternal youth and enjoy the beauty of this beautiful Incan garden.At night they rest in a selected hotel in Copacabana. Sixteenth day: "Travel by bus from Copacabana to La Paz and La Paz to Uyuni." The seventeenth day: "Starting the tour of the Salar de Uyuni." Eighteenth day: "Tour of San Juan and Laguna Colorada"
After breakfast in the town of San Juan, crossed the Salar de Chiguana. The road rises from 3600 to 4200 meters high. Along the Chilean border, we turn to the foot of volcanoes Ollagüe (still active) and Tomasamil (5900 meters), will cross the path called the Jewels: gaps Cañapa, Stinking, Honda and Ch'arkota, where we see a diverse fauna ranging from alpacas and llamas to rheas and flamingos at noon in the way we stop to have lunch and afternoon continue our tour passing Siloli desert where we can see an interesting rock formation known as the Stone Tree and afternoon arrive at the Laguna Colorada is located in the Andean Fauna National Park Eduardo Abaroa. Walk around the lake appreciating large numbers of flamingos, the red color of the lake sediments due to zooplankton, phytoplankton and others. Overnight camping on the field. (Image: Laguna Colorada). Nineteenth day: "Tour at the Laguna Colorada - Laguna Verde." This day will leave early for our tour (05:00 hrs). To appreciate the Geysers - fumaroles (volcanic), better known as "Morning Sun" This day will leave early for our tour (05:00 hrs). To appreciate the Geysers - fumaroles (volcanic), better known as "Morning Sun" then continue to the hot springs - Polques, where we have breakfast and then continue to the Lagoons "White" and "Green" located at the Llicancabur foot of the volcano at an altitude of 4,350 m, the green is high in magnesium that have the geological formations of the area, after a visit to the Green Lagoon and return to Uyuni on the way we stop for the lunch and continue our journey through the Valley of Rocks and typical populations Villa Alota - Kulpinaka - San Cristobal. Completing the tour will be transferred to Uyuni, where we board the bus back to the city of La Paz, the bus leaves at 21:00 hrs, the trip takes 10 hours overnight in the bus. (Photo: Laguna Verde). Twenty days: "City Tour in La Paz." In the morning on his arrival from Uyuni, our staff will be waiting at the bus terminal, to transfer to your hotel and rested in the morning. In the afternoon we started the visit with a walk in the witches market, craft market, after an interesting visit to an open market for fruit and potatoes discovering the social and cultural exchange of the Aymara while doing business.Then we'll go to the main colonial street where you can visit the Gold Museum of the Tiwanaku culture, visit the Plaza Murillo where we will have a comprehensive explanation of the political situation in Bolivia, the system of administration and everything connected with the "wonderful story of our revolutions. " Will continue with visits to residential areas Obrajes, Calocoto and Florida. Finish with a visit to the Magic Valley of the Moon where we will have a nice walk to observe the work of soil erosion over millions of years. In the evening, enjoy a show folk dances with colorful costumes. Night hotel in La Paz. (Photo: Moon Valley). Twenty First day: Flight from La Paz to Cusco and Cusco City Tour. " After breakfast at the hotel in La Paz, collect them and took them to the airport of La Paz, after checking will address a one-hour flight to Cusco "Archaeological Capital of America", then our staff will welcome you and transfer from airport to hotel Cusco, where we take a mate coca. After lunch at 13:30 hrs will begin the guided tour that includes visiting the center of the ancient city of Cusco, the Plaza de Armas, the Cathedral, the Monastery of Santo Domingo, Koricancha Temple and the nearby ruins of Qenqo, Puka Pukara, Tambomachay and the fortress of Sacsayhuaman, built with huge rocks that so far remains an enigma mobilization and use of these, there being no quarries in the area. At 19:00 hrs. (Photo: Plaza de Armas of Cusco). 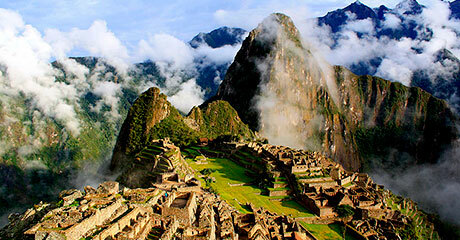 Twenty Second day: "Tour to Machu Picchu" Lost City of the Incas. " Twenty-Third day: Tour the Sacred Valley of the Incas. "